While the Labour Party's conference dominated the coverage in the UK over the past few days, its German sister party, the SPD, held its own 'mini' conference over the weekend. Opposition to TTIP - the EU-US free trade deal currently being negotiated - was a big factor at both, certainly we picked up on this in Manchester. Ahead of the SPD's conference, several local and regional SPD associations tabled motions calling on the party leadership to suspend the negotiations due to concerns about investor-state dispute settlement (ISDS) - a mechanism which allows investors to sue governments - as well as the potential watering down of labour laws and environmental standards. 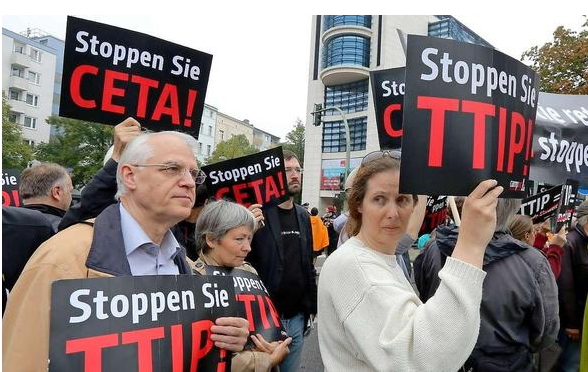 In order to head off the opposition, the Economy Ministry - headed by SPD leader Sigmar Gabriel - issued a joint position paper on TTIP along with the DGB - Germany's trade union confederation including the country's largest trade unions like IG Metall and Ver.di. The paper praises elements of TTIP but pledges that any moves to eliminate non-tariff barriers to trade (such as parallel regulatory regimes) will not threaten Europe's high employment, consumer and environmental standards, and calls on both parties to ensure "compliance with core ILO standards" - something which has little hope of getting past Congress. The SPD and German trade unions have therefore endorsed TTIP in principle, although the mass of caveats that made this possible will hugely complicate the negotiations and could wipe out many of its expected gains. It does however remain unclear to what extent the paper is binding on the SPD, as it includes the caveat that the German Economic Ministry and the DGB "do not have the same stance on TTIP on all points”. Significantly, in approving the paper, party delegates insisted that its provisions should also be applied to the EU-Canada free trade deal (CETA) which has already been largely concluded and due to be signed off by Commission President Jose Manuel Barroso and Canadian PM Stephen Harper later this month pending implementation. CETA, which many see as the blueprint for TTIP, includes ISDS and could therefore face last-minute opposition having largely flown under the radar up until now. In a separate development, which could delay CETA even further, the German government and the European Commission are at odds over whether national parliaments will need to ratify the deal alongside the European Parliament; the Commission says no, but Berlin argues that as a "mixed agreement" with some of the issues, goods and services covered by CETA falling outside of the EU's sole jurisdiction, the Bundestag and Bundesrat should also get to scrutinise the agreement and vote on it. The German government has said that it is willing to go all the way to the ECJ. All in all, it looks like progress towards concluding ambitious trade agreements with Canada and the US will be rather rocky. My name is Marian Lukasik, I would like to inform The General Public about a Court Case which is taking place on March 2015 at The County Court, Edmonton, 59 Fore Street, London N18 2TN. The subject of this case is a law suit against British workers union GMB for not fulfilling their duty according the membership contract (mainly related to organisational support and providing legal support in form of representation before Court). I am informing international and local public opinion as well as representatives of the Media about the importance of this case. I would like to invite the interested public to attend the Court hearing.